How did I start practising self-care? I started from scratch. I used to forget my needs, so it was not so easy to discover something about myself. But I did it step by step, and I have learnt that when you start to learn something about yourself, you feel a sense of fullness. It’s like when you finally find the last piece of your puzzle, and you can see the big picture. You gain the clarity of yourself, and you want to learn more and more because, in the end, you know yourself. I really hope that you can finally know who you are and what to do for yourself. I know that you can do it. You can’t take care of yourself without self-awareness. Living on autopilot means not having the opportunity to have a meaningful life. Self-awareness can make a big difference to your life. How can we cultivate and develop self-awareness? In this section you can find some TTP about how to know yourself and your needs better, how to set your boundaries and how to check your thoughts in order to manage your mental energy. · when I take care of my health my immune system is stronger. I have found my motivation and, in this section, you can find my tips about how I take care of my health through simple daily routines. In this section you can find some TTP about how you can improve your sleep, some simple exercises to have a good posture and increase your energy level, some TTP about a healthy diet and the importance of your annual check-up to prevent some serious illnesses. The content on my TTP is designed to give advice from my personal experience and they don’t replace medical treatment. Please seek professional care if you feel pain or if you believe you may have a medical condition. If you feel pain, don’t ignore it, go to the doctor, or a physiotherapist or osteopath. Paying attention to your body and noticing how you feel are the most important self-care habits. If you do not take time out for relaxing, your health may be damaged but fortunately the decision to give yourself relaxation time is entirely yours. In this section you can find some TTP about how to simplify your routine and how to relax your body during the day, how you can relax using breathing, how you can relax using visualization and how you can relax living creative moments. In this section you can find some TTP that help you to pay more attention to the beauty of the world and to express your gratitude and joy on a daily basis. It’s a slow process, but day by day you start observing the world through different eyes. You feel more compassion. You look at the beauty of the world. You start looking at something beautiful during a boring routine day. You start feeling joy reading some powerful words, and you feel a sense of satisfaction listening to a song. When you take care of yourself, you have more energy and more emotional resources to dedicate to your family and friends. You cannot do great things if you don't feel well about yourself. If you are stuck in a situation of illness or unhappiness, you can’t offer any help or support to anyone else! On the other hand, when you feel full of energy, everyone around you can feel your vitality, and you become a source of kindness and an example for your family and friends. In this section you can find some TTP to help you to spread acts of kindness and acts of love on a daily basis. Learning to take care of myself has taught me a new lifestyle, and I’m ready to share it with you. That’s why I've created “Take care of yourself tips”. It’s my way of sharing what I’ve learned from a lot of extraordinary people, many lovely books, a lot of different experiences and my daily routine. In this section you can find some TTP to help you to motivate yourself and to grow accordingly with my selection of the most significant tips I’ve found and followed. You can try a new TTP or more every day. I invite you to get involved in the site by commenting, sharing a post, or introducing yourself on Fb or an email. I’d like to know how you are improving your life and how do you feel trying my TTP. It's a lot easier to be who you want to be in this world when you remember you are never alone. We are all in this together, and we all have something to teach and something to learn. You can make a difference. We can share our experiences and find new tips to improve our self-care together. I'll be really pleased to hear from you! 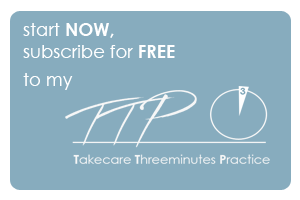 To start using my TTP, subscribe for free, and you will get full access to all my TTP ! Thank you so much and have a good TTP!